Border Police officers stationed at Tapuah junction shot at suspicious Arab female who rushed them, injuring her foot. The suspected Arab terrorist was shot at the Tapuah Junction in Shomron this afternoon, after ignoring calls by Israeli security personnel to halt, apparently intended to commit suicide-by-police because of a family situation. According to a report by a police spokesman, the female suspect approached Israeli Border Police officers at the junction checkpoint, and ignored calls by the officers that she halt. After the suspect refused to stop advancing on the officers, security personnel fired warning shots in the air. When the suspect continued to approach, officers opened fire on the suspect, wounding her in the leg. Examination revealed the Arab, a resident of Tulkarm in her 40's, was unarmed. Preliminary interrogation revealed she apparently intended to commit suicide-by-police because of an incendiary family situation. 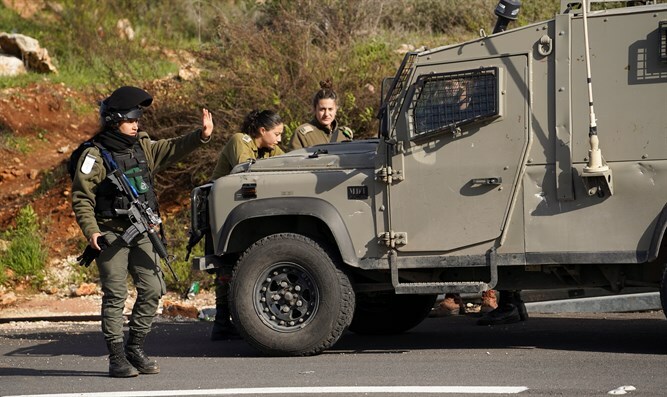 The Border Police emphasize the soldiers acted as expected in light of the incident's circumstances, which ended with measured and precise shooting, injuring the suspect who did not respond to their calls, apparently with the intention of ending her life.